It was a brisk winter day in December 1951, as a heavy snow blanketed the winding roads outside the city proper of Heidelberg, Germany. It would have been a beautiful sight for the middle aged man to behold for a while, if it weren't for his pressing urgency to travel early that morning. Dr. C. Josef Lamy was in a hurry to get to the office, as several production issues that cropped up the night before were delaying the manufacture of the first pen that would bear his name--the Lamy 27. The start of a book on the history of Lamy? No... just a little flight of my imagination. Lamy (pronounced LAH-mee, accent on 1st syllable), the internationally known German pen company based in Heidelberg, is best known for making pens that are sleek, highly functional, minimalist in design, and innovative in functionality. Several of their designs over the years have won many awards, with the Lamy 2000 being the most recognized of all. It is that pen which has defined the modern day theme and design foundation of Lamy. It also marked the changing of leadership from C. Josef Lamy to his son Manfred. In essence, Lamy has viewed this change as the birth of the modern day company, to the point where little recognition is given to their products made before that time (the Lamy 27 is mentioned but once on their website). I find this a shame, because Lamy had made some very respectable writing instruments prior to the 2000, one of which was the Lamy 27. 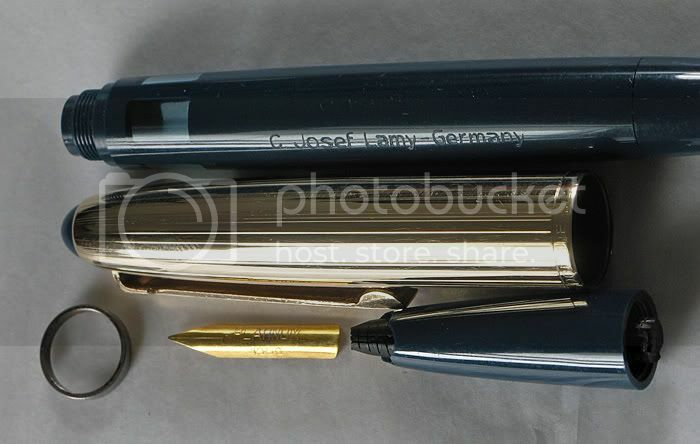 In 1930, C. Joseph Lamy ceased working for the Parker Pen Company and started manufacturing his own fountain pens in Heidelberg Germany, initially under the brand name "Orthos". In 1949, production of a newly designed series called "Artus" commenced. 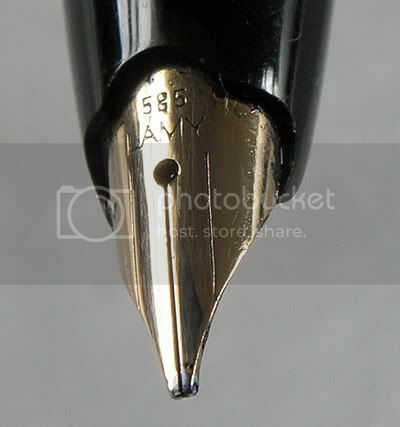 Then in 1952, the company switched its name to "Lamy", remaining as an independent family-owned enterprise. The company proved its innovative prowess in the very first year of the Lamy brand with the completely novel LAMY 27 fountain pen series. And in 1966, upon the succession of leadership by Joseph Lamy's son Dr. Manfred Lamy, the distinctive style of Lamy Design was born with the model 2000. With an annual production of over 6 million writing instruments and a turnover exceeding ~50 million Lamy today is not only the market leader in Germany but also ranks among the German design brands whose products hold a special position worldwide. 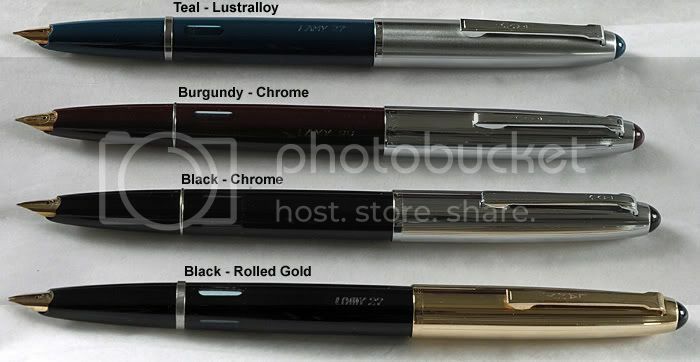 October 26, 2006 commemorated the 40th year milestone anniversary of Lamy's modern day design history. Dr. Manfred Lamy retired on November 10, his 70th birthday. Although he has a son and a daughter, neither is particularly interested in following in his footsteps. As a result, for the first time in its long history, Lamy will be led by a non-family member, Bernhard Rösner. 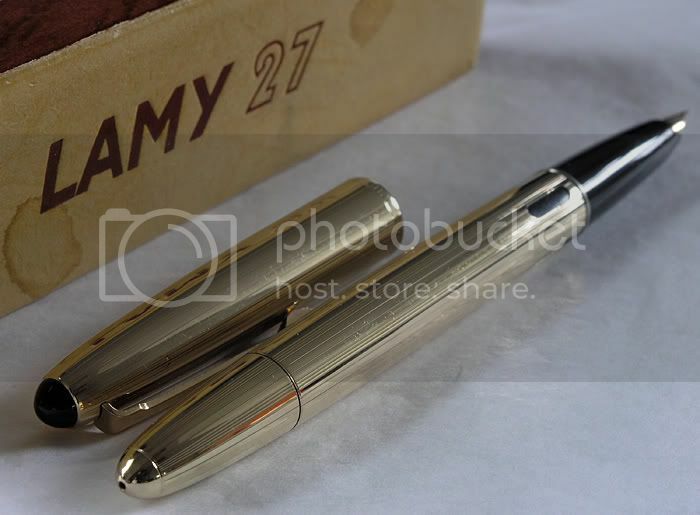 The Lamy 27 was introduced in 1952. It was an extraordinary best seller, a streamlined pen with a semi-hooded Osmium tipped nib. The 27 was produced in 12 varieties from plastic models like the 27e for 20DM (Deutschmarks) to luxury models like the 27n with a gold cap for 39DM (there were also intermediate models for 25DM and 30DM). This was not cheap for an unknown trademark at the time (source from 1955), with pricing very similar to Montblanc and Pelikan pens. 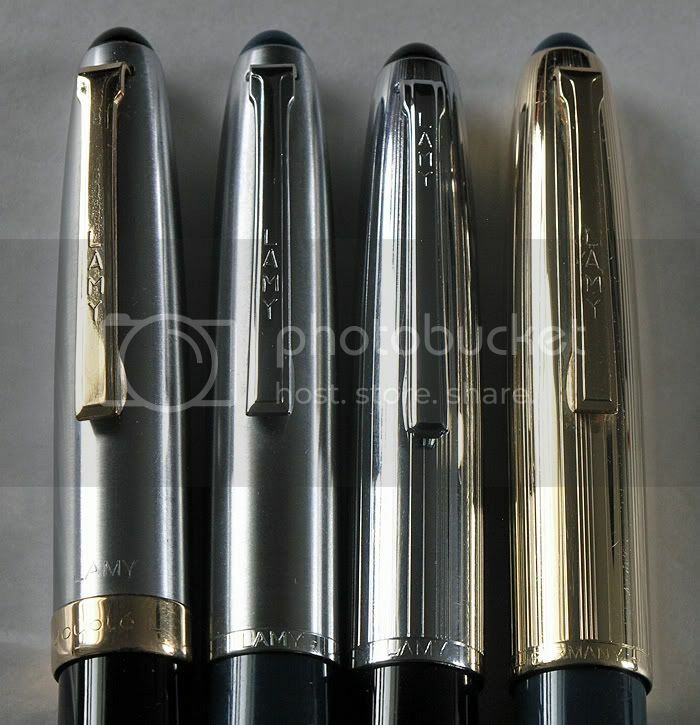 The 27 was the first LAMY pen which was made under the name of the producer, whereas the previous names had been "Orthos" and post-WWII "Artus". 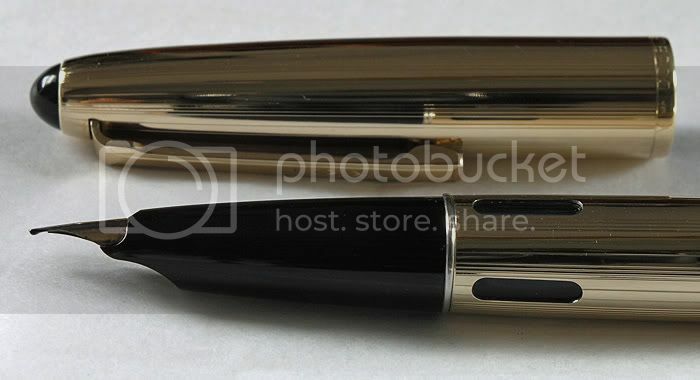 The understated looking pen had a revolutionary and patented system of inlaid micro segments around the feed, which made the ink flow insensitive to air pressure or temperature changes (called the "Tintomatic" system, the design of which is still in use today). 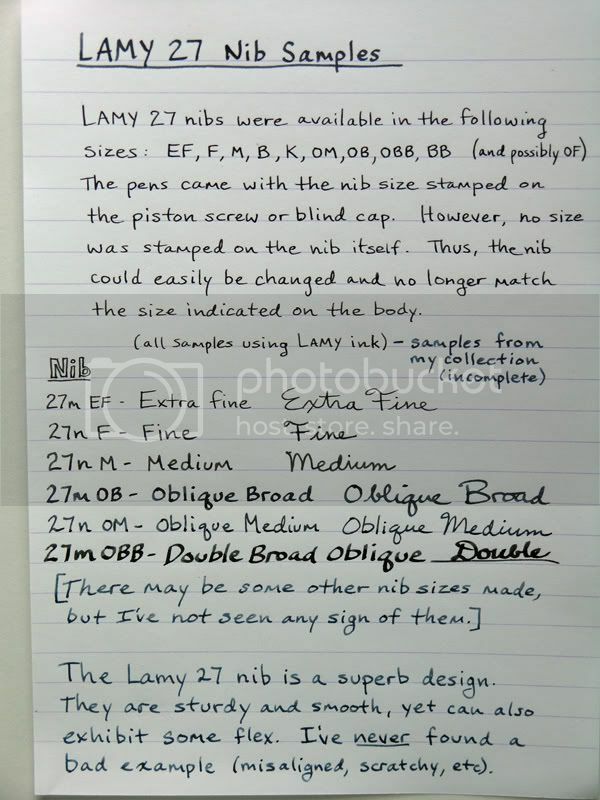 The Lamy 27 was likely made until the mid 1960's. When Dr. Manfred Lamy took over the firm from his father C. Josef Lamy in 1966, he made some fundamental changes in the product lines and in the overall design by hiring several key designers like Gerd Müller (designer of the 2000). It was Dr. Lamy's vision that defined what Lamy is today, so much so that little is spoken of pens made prior to that time. In fact, if you were to ask him what was the first pen the Lamy company produced, you will be told it is the model 2000. Despite this, I feel the 27 is a beautifully understated example of fine pen making and deserves some recognition. The Lamy 27 is a very capable pen, displaying a classic design and innovative functionality. Although the overall design was not that unusual for its time, there were some striking exceptions (such as the nib section). Pros: Semi-hooded nib that resists drying out, rapid interchangeable nib design, readily found oblique nibs, usable ink windows, above average ink capacity, dependable piston filler mechanism, and portable size. 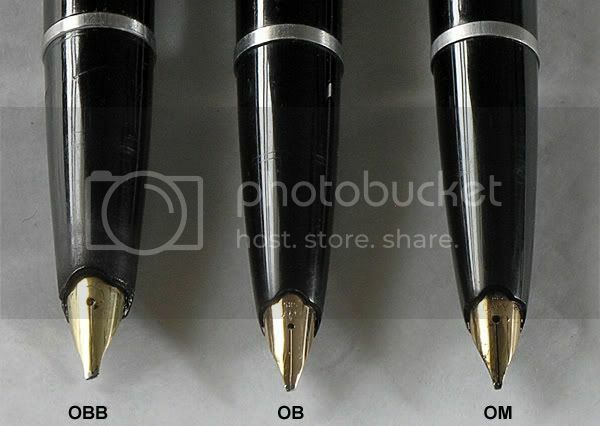 Cons: Nib size is stamped on the barrel, which becomes invalid upon changing the nib to a different size; nib size is not stamped on the nib, so you can end up loosing track of the actual nib size when interchanging; pen body is slightly more susceptible to scratches than if made from Lucite. The Lamy 27 captures classic styling of the late 40's/early 50's. It shares a very similar design to the Parker 51, enough that the 51 must have had an influence on design choices. Size wise, the Lamy 27m is longer than the Parker 51 posted (based on my personal vacumatic copy). There were two prominent model variations: the 27n and 27e. The 'e' denotes a plastic cap, while the 'n' indicates a metal cap. The metal caps came in lustralloy, lustralloy with gold accents, chrome, and rolled gold. There are two basic line patterns on the caps. All of them have clips that are secured by a black 'jewel' screw piece at the top of the cap. 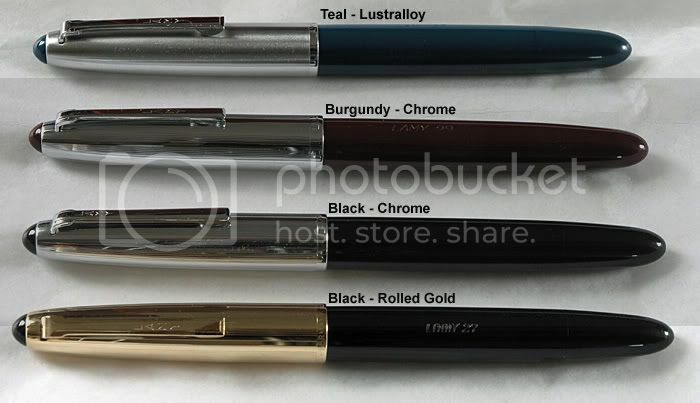 The bodies of the Lamy 27 came in a variety of colors (exact number unknown), of which I have seen just five: teal, burgundy, black, blue, and cocoa. Three are shown below. 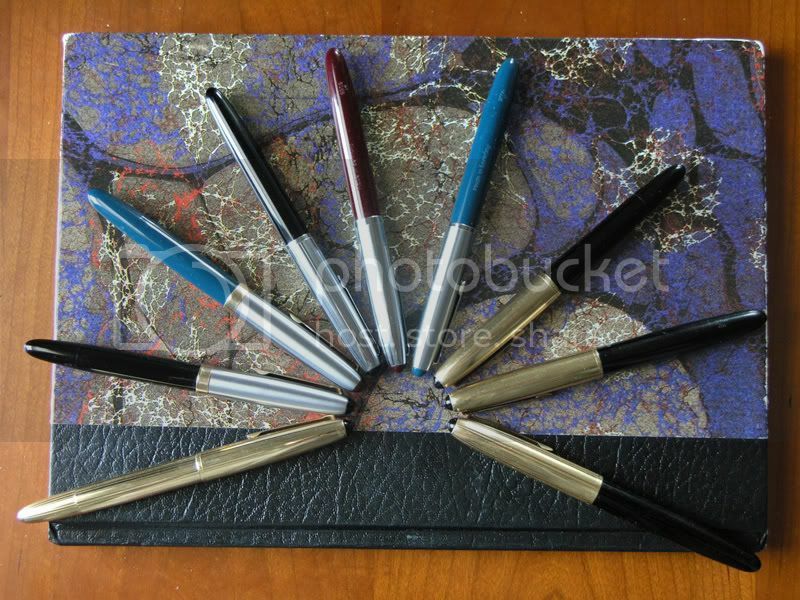 Clearly, with 17 different colors the Parker 51 won out on color variations! There are a few other interesting variations to note. There was a model 27m that features a slightly longer barrel and wider girth (essentially matching the Parker 51). Rather than the bottom section of the pen serving as the screw knob for the piston, a blind cap would be removed to reveal a thinner fluted knob for turning the piston. Apparently this model had a lower production run than the 27n, as few are found today. Also, there was an even more limited version of the 27m, having "Heidelberg" imprinted on the cap (there does not seem to be any other distinctive features). I stumbled upon one quite by accident and I subsequently learned these details from a German pen seller. Another notable variation was a fully rolled gold model, much like the Parker 51 Presidential. But instead of the wavy lines as seen on the 51, this model had evenly spaced groupings of straight lines. 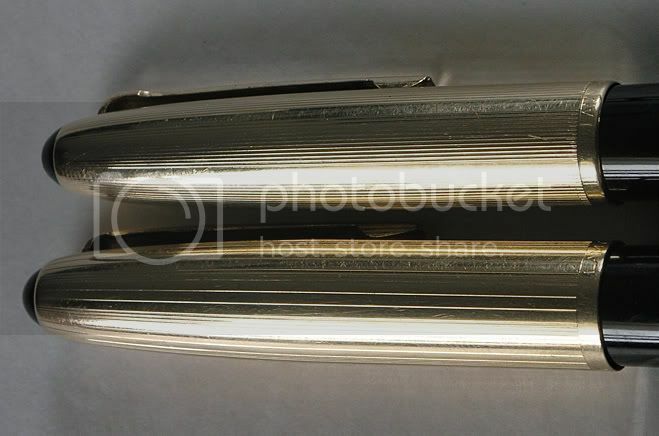 One interesting design note: small elliptical cuts were made in the barrel to reveal the ink windows, thus avoiding the typical segmented ink window section--the barrel would remain one contiguous section (aside from the piston screw section). As the model progressed in its later years, the streamline shape was squared off a bit. The black dome jewel was replaced with a black disk with a white inset circle and a black "L" prominently in the center. On some models a '32', '30' or '30n' was added after '27'. I haven't been able to confirm what that designation means, but I suspect 30=plastic cap, 31=steel cap, and 32=gold cap. Later on, the model '99' was introduced that was based on the Lamy 27, but with some cheaper elements for a lower price point (in fact, it looks almost exactly the same--in one case, I obtained a Lamy 99 that looks nearly 100% like a Lamy 27, except for the thin clutch ring). The 27n is nicely weighted, almost the same as a Parker 51. The tapered design allows for easy posting of the cap without undue pressure, and thus avoiding noticeable scratches. The push-on cap has an excellent inner clutch that "clicks" firmly onto the clutch ring when capping the pen, and slides off with simple effort. Four evenly spaced rounded rectangular ink windows are located just behind the clutch ring and do a marvelous job of telling you how much ink is left in the pen (some early versions had squared off ink windows). The nib section easily removes for cleaning and interchange. The filling mechanism is a piston design. The Lamy 27 is not an above average pen in size, but the efficient piston filler design allows it to store an above average quantity of ink--1.5 ml to be exact (.1 ml more than the 2000!). The piston screw turns firmly but easily (better than the 2000), flushing and drawing ink with reliable efficiency. I have yet to encounter a Lamy 27 with a faulty piston, and based on the age of these pens, I'd say the mechanism has proven its design worthy. 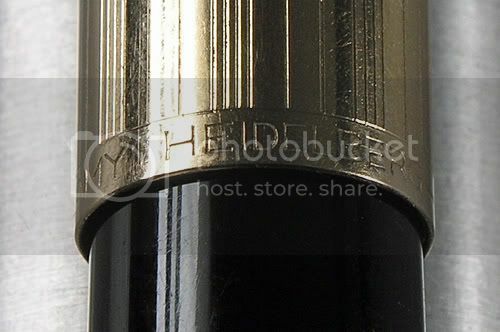 Aside from observing the ink level in the ink windows, you can also see the piston when it is fully extended. 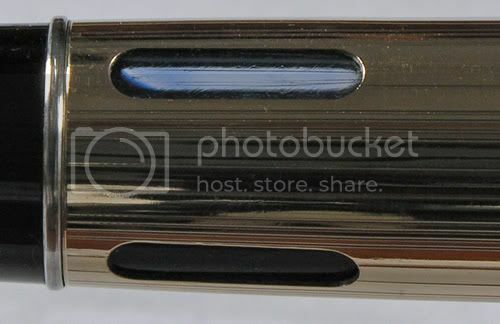 The built-in feed contained in the nib section features a "Tintomatic" design that is resistant to air pressure and temperature changes, allowing consistent ink flow under all circumstances. So far, I have found this to be true. You can see a portion of the ink feed design in the parts image displayed below. 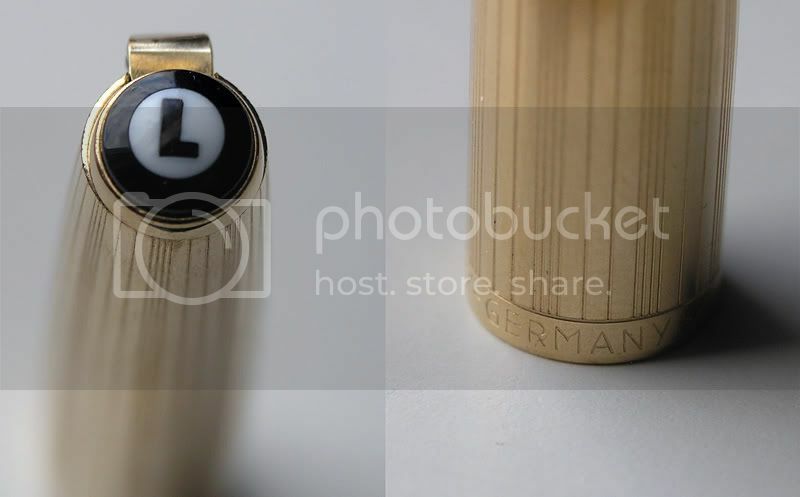 Note: In the image below, you can see 'Platinum' stamped on the nib--this is not a Lamy nib, but came stowed in the barrel; the previous owner must have thought the nib might work, but it doesn't, so I'll have to edit the photo). Also notice that 'C. Josef Lamy' is imprinted on the barrel--this may be a rare example of an early Lamy 27, as I've never seen any other Lamy 27 with his name imprinted like this (export or domestic). The Lamy 27 was not cheaply priced back in its time, but that should be of little concern today. Depending on the luck of the bidding pool and shipping restrictions for a given Lamy 27 auction, you can at times obtain these pens somewhat inexpensively (especially when not properly titled and only shipping within the USA). Of course, the main value here not found in Parker 51's is the fairly common availability of oblique nibs. Usually for USA only auctions, I've bought these for $30, $40 and $50. For auctions by well established German pen sellers, these pens can command prices a little less than comparable condition Parker 51's. I have seen several of them close on auction recently at prices like $55, $61, $75, $82, and $96 (lowest for 'M' nib, highest for 'OBB' nib). The fully rolled gold model was much more expensive! 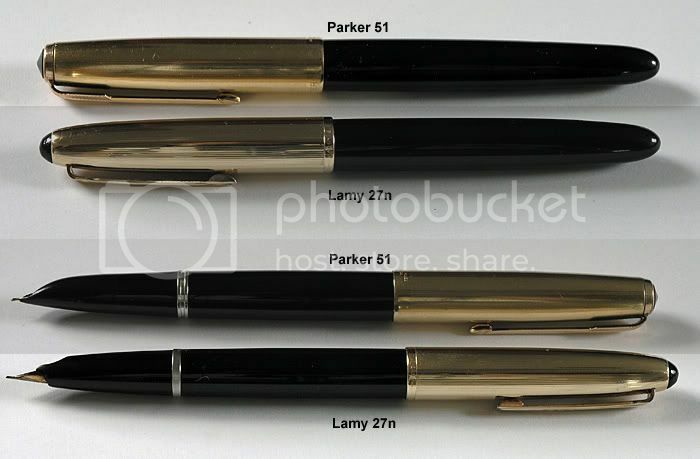 If Lamy had a stronger marketing campaign in the USA during the 1950's, I really believe it could have displaced the Parker 51 as "the world's most wanted pen". 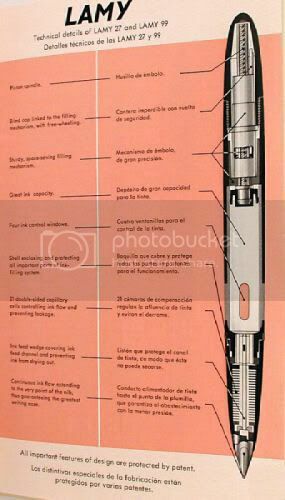 Here you have a pen with two key features over the 51: a very usable ink window and a highly reliable piston filler mechanism. Yes, the Parker 51 Aerometric filler is less complicated and very reliable, but it doesn't match the ink capacity of the Lamy 27. And there's nothing more annoying than running out of ink when you least expect it--not a problem for the 27 with its ink level indicator. Plus, the form factor, balance, and nib performance are exemplary. 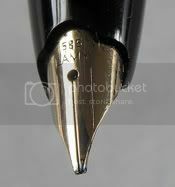 For anyone who enjoys Parker 51's, a Lamy 27 should definitely be in their collection. One last note: I really do like the Parker 51! It is a pen that definitely has its own merits and I will always have several in my collection. As the title of this article said, "Contender to the Parker 51"—both pens are prized writing instruments. Better later than never. Here are some photos of the nib and feed from two Lamy 27's. Removal of the nib is not as difficult as I had first thought. What makes it troublesome is that there is usually some dried ink helping to secure the nib and feed inside the section. It can require some long sessions in an ultrasonic cleaner to break them loose. The general practice is to apply downward pressure on the nib and feed tip, pushing back into the section. The feed (along with the nib) will slide a millimeter or two backward. 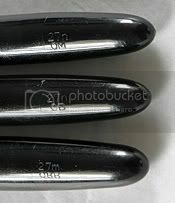 It may help to use some rubber or a cloth to help get a grip without damaging the nib and continue to apply pressure. Eventually the whole nib and feed slides out. The nib has two main pieces--the usual finned section that has the nib rest attached and an ink guide that sits on the top groove. There is also a rubber grommet that goes over the rear part of the feed, which acts as a buffer for the barrel tube that screws inside the section. And lastly, there is a clutch ring that sits inbetween the section and the barrel, similar to the Parker 51 design. It has a slight improvement to the original feed design. 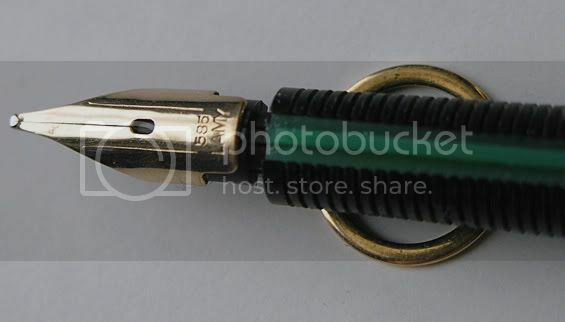 In this version, the nib is crimped onto the feed so it won't come off easily. (I had the unfortunate experience of seeing the nib slide off the feed of my 27n and go right down the drain of a sink, like a hockey puck into a net! So I appreciate this improvement). The patented feed design remains pretty much the same, though. 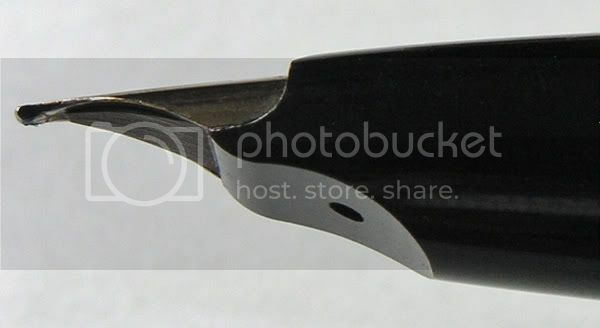 Here's a close-up of the cap, nib, feed, barrel, and other parts on a Lamy 27 32. The number suffix after '27' appeared on later models, and I've seen three of them so far ('30', '31', '32'). I suspect the '30' means a plastic cap, '31' a steel cap, and '32' and gold plated cap. I really like the cap design of the Lamy 27 32. The "L" disk on the top of the cap has a more luxurious look to it than the plain black dome. Also, the disk has a nice gold bezel on it. 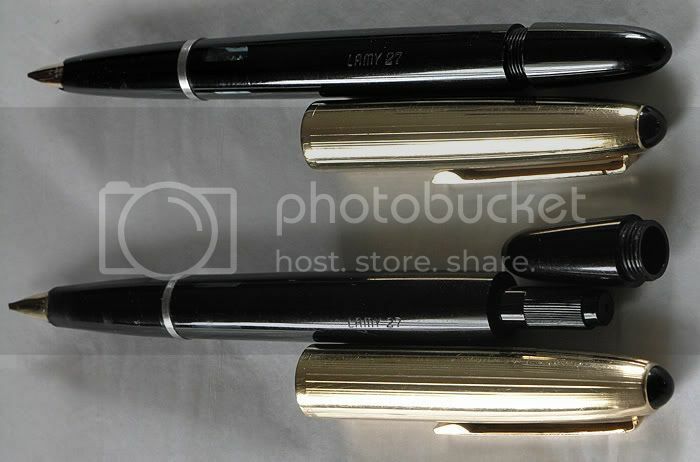 One other interesting bit of trivia--I came across two Lamy 27m models without gold filled caps. One was all brushed aluminum (Lustralloy) and the other had a nice thick gold band with a gold clip (same design on the variations shown earlier in this review). The all aluminum cap had "Heidelberg" stamped on it, but the other did not. It's supposed to signify a special edition, but I've yet to see what attribute that is (apart from the imprint). Earlier, someone had asked about nib compatibility. I apologize for missing that and not explaining sooner. The 27n and 27m nibs are definitely of different sizes. From what I can see, most 27n nibs are compatible with each other, before the number suffix appeared ('30', '32', etc.). 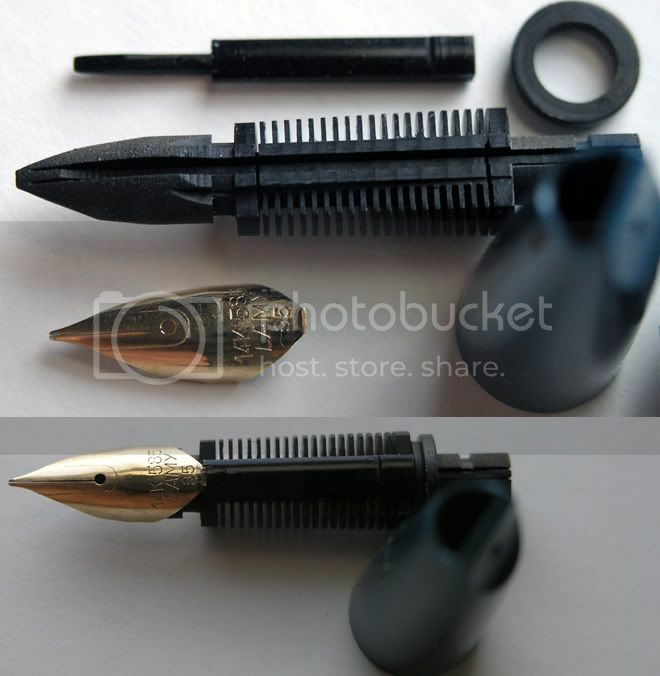 And from a direct side-by-side comparison, it looks like you should be able to take the nib from an all plastic model with screw cap and put it in one that has a metal push-on cap. However, a visual inspection of a Lamy 99 and Lamy 27 together revealed some very slight side differences... I didn't try swapping the nibs, but it looked to me like they weren't interchangeable. Edited by MYU, 19 December 2009 - 05:15. Great review, Gary, and wonderful photos! Now please explain to everyone that the 27 is not really a desirable pen--so I can get mine first! Thanks, Dan! Um, sorry about that everyone. The pen review should be about the "Lamy 51", not Lamy 27. Please make a note of it when searching the Internet. As always, tons of info in your posts. Thanks MYU! Random notes are your friend. This was excellent. I looked these pens up a while ago and wasn't able to find much satisfactory info. I speak German, but very poorly (especially when technical words are being used!) so a good English source of info is truly ausgetzeichnet. And I liked your intro, even if it is fictional. Excellent review Gary and what a nice pen it is! WOW! Thanks for the thorough review of this pen. It is on my list and now even more so. 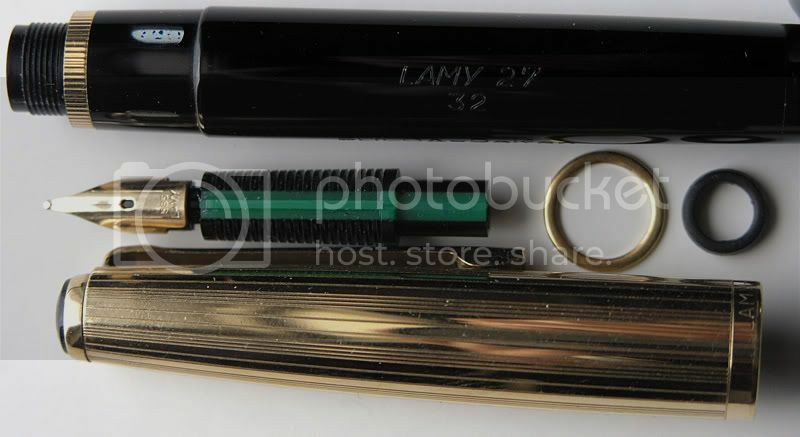 I missed a lamy 27 with factory stub (om maybe) for $50 that I would have loved to have gotten. I have 3 p51's and a vint aurora 88k. Hopefully, I will find a lamy 27 with om. Thanks for this review -- rich in information and detail. I didn't even know there WAS a Lamy 27 before reading this. I've updated the review so that you don't have to be logged in to see the images, and I've made a number of grammatical fixes as well as clarified my position on the Parker 51. Nice review. Had I been armed with all this info, I would have bid more aggressively on a couple. At the time, I didn't know enough about the pen. One question: On modern Lamy's, the advice seems to be that the nibs run pretty wide compared to other manufacturers, and to go one size finer than you normally would. In your opinion, is that true of the Lamy 27, or does it run pretty true to size? An intriguing and enticing pen. Dare I add it to the (growing) wish list? This is generally true for the Lamy 2000, but I think most others write true to expected nib sizes. There are some good reviews out there on the Accent, Safari, Vista, Al-Star, Studio, and Persona. If you end up considering one of them, definitely read the review to see what the nib impression is. The Safari looks to be one of the most popular. I do plan to own one... one of these days! Fascinating. I had no idea the company had such history. Moderators, why is there no Lamy Forum in the Brand Focus section? Seems everyone's talking about 2000s or Safaris, and theres' plenty of use and opinions out there. Even, apparently, a strong vintage component. Excellent review of a beautiful pen that I have never heard of. I am sure to add a few to my collection. I was told by administrators that 9 brands is basically enough and that they don't see enough messages about Lamy (nor Pilot--biggest Japanese pen maker) to warrant a separate forum section. But I do wonder about Cross and Wahl-Eversharp doting along at 182 and 170 topics total respectively... 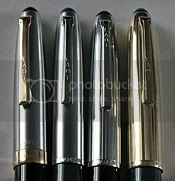 I wonder if a "German Pens" forum would be in order, to capture Lamy, Kaweco, Geha, etc. Thanks for the praise, Shelly! Very good point about the handwriting; I will make an update this coming weekend to include examples. While I do think there should be German pen forum, Japanese etc. Wahl-Eversharp IS one of the Big 4, so theres really no way to get rid of it. I really think Syd Saperstein has done a great job keeping the forum a fun place to be for a non Wahl collector. My hats off to you Syd! Cross... I dont think it should be there, but thats just me. I love your detail and creative introduction!! Great review that I will read more thoroughly soon. This has renewed my interest in a lamy flagship pen: where are some specific places I can find one for sale? eBay? I definitely agree there should be a Japanese pen forum. A Chinese forum wouldn't be ridiculous either. German pens are already well represented by the Mont Blanc and Pelikan forum, so I'm not sure that Lamy and Kaweco are enough to have their own "German Pens - other" forum. I know adding forums takes money, and I wouldn't want to see Fountain Pen Network collapse under its own weight. That said, I would probably spend time in both! My limited experience with Pilot has been good, and I own a couple of Lamys. I find them to be interesting companies. Thank you for indulging my opinion on this matter, and once again, great Lamy review. Edited by Headache Corporation (TM), 06 June 2007 - 04:03. Thank you, David. These pens aren't nearly as plentiful as the Parker 51, but they can be found if you look hard enough. "FleaBay" is where I've purchased most of mine, although some vintage German pen sales websites have them from time to time.